Today I finally got round to doing my version of a Modigliani. I really like several of his female portraits but, I finally chose this one to do my version. 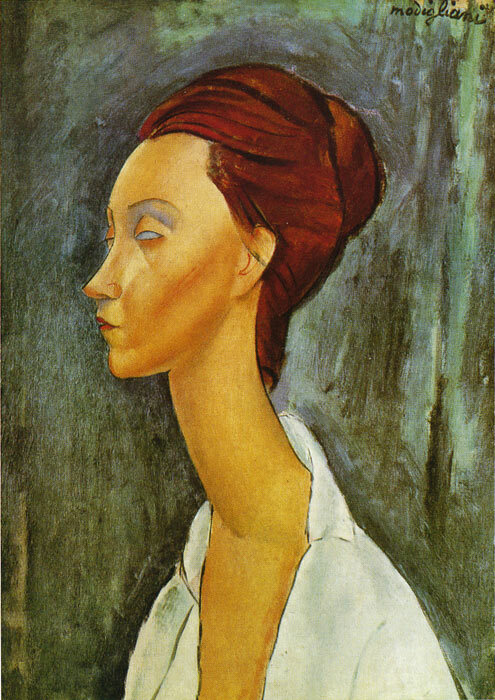 I really like the way Modigliani depicted her bone structure. He did most of his paintings in oil but for my version I decided to have a go with soft pastels and pastel pencils. I have posted the final painting under the Pastel Paintings tab. This entry was posted in Pastel Pencils, Portraits, Soft Pastels on April 29, 2013 by Lea Sapsford. Today’s lesson was all about moving water. My art teacher showed us lots of different techniques to create a wave and the sense of movement. We started off with charcoal and then moved on to colour. I chose to use soft pastels after my charcoal drawing and I can’t wait to have a go with different paints. I have posted each picture under their respective tabs. This entry was posted in Charcoal, Soft Pastels, Waves on March 1, 2013 by Lea Sapsford. Following on from last week’s lesson today was all about eyes. We sat 4 to a table (2 either side) and took it in turns to draw each other’s eyes. I was surprised to find for a subject we look at every day, just how much we take them for granted until it comes to drawing them. After drawing each other’s eyes in graphite my art teacher gave us some magazine pictures. This time we were going to use Soft Pastels, to introduce some colour. I’ve posted both under the Practice Pieces tabs. Next week we are going to tackle a full portrait either stylised or tradition. I’m planning on doing a stylised self portrait in oils. I’ll post the completed painting as soon as it’s done. This entry was posted in Eyes, Graphite, Practice, Soft Pastels on October 12, 2012 by Lea Sapsford. We started the term off with an observation lesson. My art teacher brought in chilli peppers to draw or paint. I chose 3 and instead of doing a tonal drawing like I would normally do, I decided to use soft pastels. I did find using them a little challenging to get the colours right however, I was really pleased at how quick they were to use and I was really happy with the final painting. I have posted the painting under the Pastel Paintings tab. This entry was posted in Soft Pastels, Still Life on September 28, 2012 by Lea Sapsford.